An enigmatic young woman's possible destinies in life are examined through an alternating pair of stories. Philosophical New Yorker Sy is at a dinner party with several friends when he courts a discussion about the perilously fine line dividing humor and tragedy in any given story. 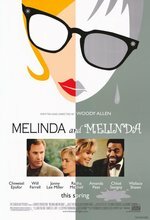 Sy's contention frames Melinda and Melinda's prevailing narrative, following its titular character as two somewhat similar, yet wildly different paths in her life -- one comedic, the other melodramatic -- drive her to opposing ends. Comedic Melinda arrives dazed and confused at a dinner party, reeling from a recent divorce; her friend Susan places her in a bizarre love triangle after attempting to set her up with a dentist. Sad Melinda, on the other hand, crashes a dinner party on drugs and ultimately winds up in a mental ward. Quincy Rose ... 2nd .D.